Under 7 Yellows started the game with all eight boys available again on a windy day in their first home league game of the season. The boys struggled to start with and found themselves behind early on when a good through ball caught the yellows defence cold and the striker slotted home to make it one nil to Aycliffe. The Yellows recovered quickly when Kian received the ball on the left he played a well weighted pass which Fin struck with venom to bring the scores level. Stockton swiftly took the lead when Fin made a good run down the right and played a delightful cross for Archie to put away well and give the Yellows the lead. This was as good as it got for Stockton, with chance after chance being missed this was to cost them dearly when some sloppy defending and some clinical finishing by Aycliffe the Yellows found themselves 5-2 down at half time. Stockton knew that they would have to be at their very best to take something from the game and they started the half brightly but a miscommunication at the back left the Aycliffe striker on his own and he finished well to leave the yellows an even bigger mountain to climb and make it 6-2. The boys then rallied and started to play some good football but couldn’t find the finishing touch, with just over five minutes left they managed to reduce the deficit when Archie finished well from a Fin through ball to make it 6-3. Almost from kick off they managed to score again when some good pressure from Kian enabled him to win the ball and strike a right footed effort which the keeper done well to save and Archie followed in to make it 6-4. Time was running out and Stockton were unable to add to their tally and fell to their first defeat of the season, on another day if they’d taken the chances created they could of won the game but credit to Aycliffe on the win. 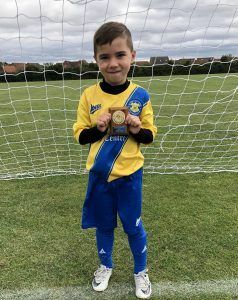 Player of the match was Archie who took his goals well and never stopped, but most importantly is doing exactly what the coaches are asking with some brilliant passing and is creating chances for others as well as himself. The boys will use the disappointment and will learn from it, they will no doubt be back to their brilliant best when they face Norton & Stockton Ancients in their next game.